What parts of your ecommerce product page are seen in the crucial first seconds of a visit? What’s the worst and the best thing that could happen to your e-commerce site? 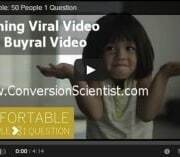 The answer is that a Conversion Scientist tried to buy something from you. It’s good because, we are very likely to write about our experience. It’s bad because we are going to point out what you’re doing wrong. We recently tried to buy some stand-up desks for some of the team here at Conversion Sciences. Like so many shoppers, we found ourselves paralyzed by choice. In true Conversion Scientist form, we decided to collect some data to help us with our choice. We compared desks at National Business Furniture, Rakuten and World Market. However, our decision to buy was based on how their product pages performed, not on price and features. We invented the game Product Page Roulette. Find out which site won our dollars (and probably the dollars of many other visitors) in my Marketing Land column An Expensive E-commerce Game: Product Page Roulette. Why the @WorldMarket site is winning the ecommerce game.